Lusi is the nickname of Lumpur Sidoarjo — 'the mud of Sidoarjo' — the giant mud volcano in the city of Sidoarjo, East Java, Indonesia. This week, Lusi is eight years old. Before you read on, I recommend taking a look at it in Google Maps. 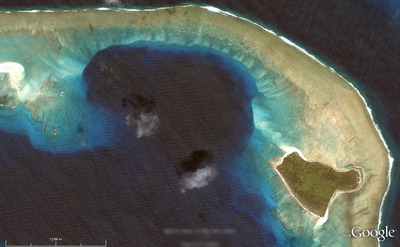 Actually, Google Earth is even better — especially with the historical imagery. The mud flow was [may have been; see comments below — edit, 26 June 2014] triggered by the Banjar Panji 1 exploration well, operated by Lapindo Brantas, though the conditions may have been set up by a deadly earthquake. 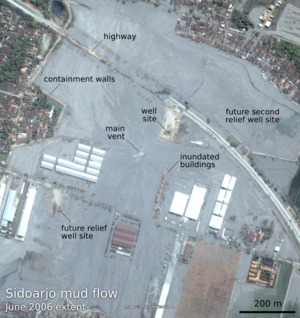 Mud loss events started in the early hours of 27 May 2006, seven minutes after the 6.2 Mw Yogyakarta earthquake that killed about 6,000 people. About 24 hours later, a large kick was killed and the blow-out preventer activated. Another 22 hours after this, while fishing in the killed well, mud, steam, and natural gas erupted from a fissure about 200 m southwest of the well. A few weeks after that, it was venting 180,000 m³ every day — enough mud to fill 72 Olympic swimming pools. In the slow-motion disaster that followed, as hot water from Miocene carbonates mobilized volcanic mud from Pleistocene mudstones, at least 15,000 people — and maybe as many as 50,000 people — were displaced from their homes. Davies et al. 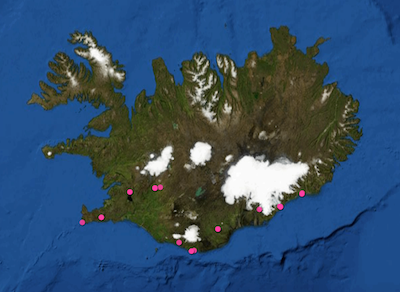 (2011) estimated that the main eruption may last 26 years, though recent sources suggest it is easing quickly. Still, during this time, we might expect 95–475 m of subsidence. And in the long term? 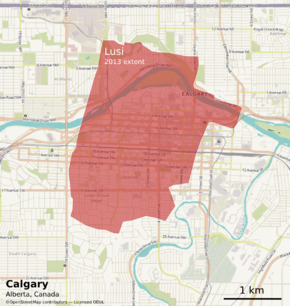 Quite a bit has been written about LUSI. The Hot Mud Flow blog tracks a lot of it. The National University of Singapore has a lot of satellite photographs, besides those you'll find in Google Earth. The Wikipedia article links to a lot of information, as you'd expect. The Interweb has a few others, including this article by Tayvis Dunnahoe in E&P Magazine. Satyana, AH, and Asnidar (2008). Mud diapirs and mud volcanocs in depressions of Java to Madura: Origins, nature, and implications to petroleum system. Proceedings of the Indonesian Petroleum Association's 32nd Annual Convention. IPA08–G–139. May 2008. Mazzini, A, H Svensen, G Akhmanov, G Aloisi, S Planke, M Sørenssen, and B Istadi (2007). Triggering and dynamic evolution of the LUSI mud volcano, Indonesia. Earth and Planetary Science Letters 261, 375–388. After a long break from this awesome game, I got WoGE #314 by simple recognition. I've never been to Florida, but have scoured the whole region looking for interesting modern analogs. So I have the honour of turning in the next edition; the time is 1100 ADT, 1400 GMT, or 44-07-07 ∇ 14:19:14 Lunar Standard Time. In case you're on the moon. Where on (Google) Earth is the best way to tour the virtual globe since the mighty View-Master. If you are new to the game, fear not, it is easy to play. The winner is the first person to examine the picture below, find the location (name, link, or lat-long), and give a brief explanation of its geological interest. Please post your answer in the comments. And thanks to the Schott Rule, which I am invoking, newbies have a slight edge: previous winners must wait one earth hour for each win before playing—with a maximum of 48 (yes, some people are quite good at this game). So: where and what the Dickens is this? 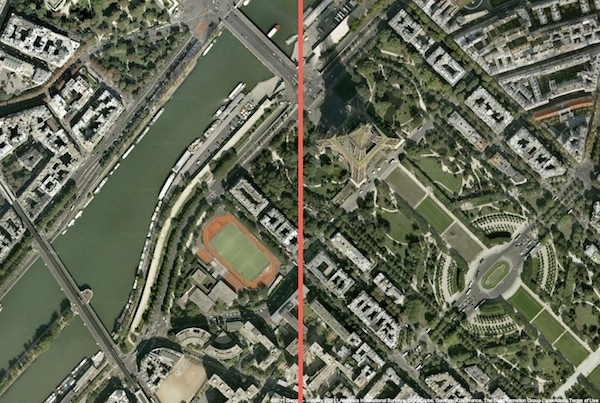 This is off-topic; please refer to the comments to see why there is a picture of Paris here. I got WoGE #271 by the well-established lucky guess method. Some people mightn't think this is a method sensu stricto, but I will take what I can get. So I unabashedly declare victory and bring you number 272, fresh out of the oven; the time is 1600 AST, 2000 GMT. Where on (Google) Earth is the best way to get a repetitive strain injury since interpreting seismic data. If you are new to the game, it is easy to play. The winner is the first person to examine the picture below, find the location (name, link, or lat-long), and give a brief explanation of its geological interest. Please post your answer in the comments. And thanks to the Schott Rule, which I am invoking, newbies have a slight edge: previous winners must wait one earth hour for each previous win before playing. 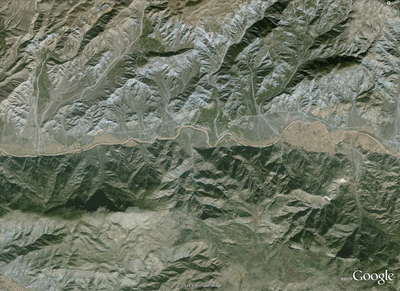 So: where and what on Google's green earth is this? Much thanks go to Matt here for hosting this WoGE for me since I do not yet have a blog of my own. I'm already looking into options. This is just too much fun for a Google Earth addict like me. Although this image is zoomed in pretty good I'll invoke the Schott Rule just to give newcomers like myself a chance. For those unaware, this means you must wait one hour for each previous WoGE win before you can post your answer. [Here are the previous winners in Ron Schott's KML file — Matt]. I've also hidden the orientation compass so you can safely assume North isn't necessarily at top. Can't make it too easy now, can we? This one isn't just about the geology, but also the historical significance. Please post responses in the comments. Posted at 0800 Atlantic, 1200 GMT. 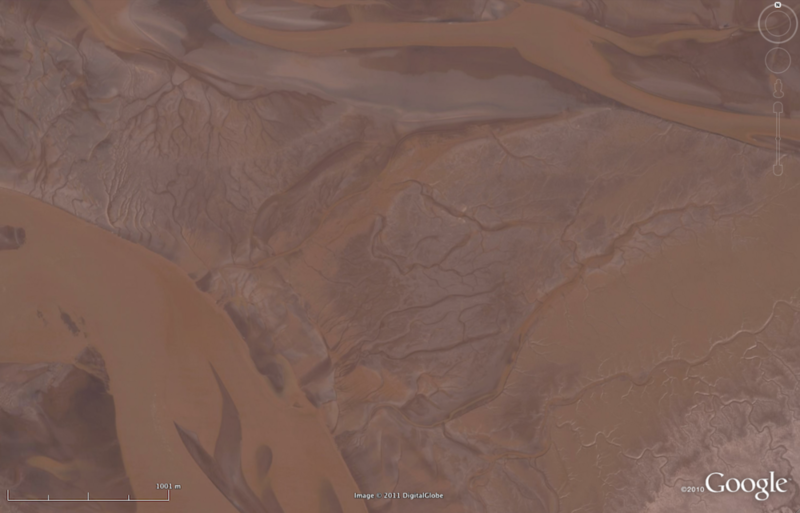 Felix Bossert stumped us with one of the most unusual geomorphologies on the planet with WoGE #251 last week. The sub-parallel elongate low-sinuosity (OK, wormy) features, reminiscent of a fingerprint, turned out to be the acidic dregs of a salt lake in Western Australia. 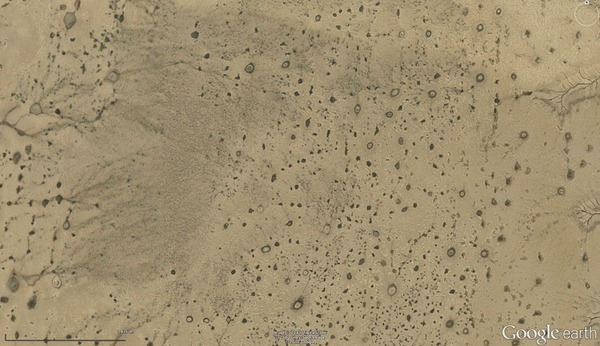 Where on Google Earth, the brilliant brainchild of clasticdetritus, is the best use of satellite imagery since looking at homes and gardens of the rich and famous. If you are new to the game, it is easy to play. The winner is the first person to examine the picture below, find the location (name, link, or lat-long), and give a brief explanation of its geological interest. Please post your answer in the comments. Thanks to the Schott Rule, which I hereby invoke, newbies have a slight edge: previous winners must wait one hour for each previous win before playing. 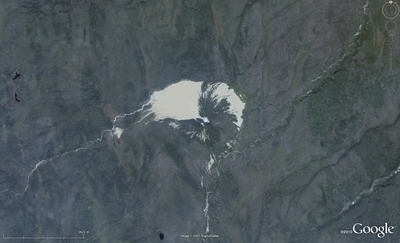 Where and what on Google's blue earth is this? Elisabeth Kosters, who correctly identified the Bay of Fundy in WoGE #248, asked me to host her challenge for the next instalment. So here we are again. Welcome to WoGE #249. Where on Google Earth is the best use of a high-speed internet connection since e-journals. If you are new to the game, it is easy to play. The winner is the first person to examine the picture below, find the location (name, link, or lat-long), and give a brief explanation of its geological interest. Please post your answer in the comments below. And thanks to the Schott Rule, which Elisabeth is invoking, newbies have a slight edge: previous winners must wait one hour for each previous win before playing. 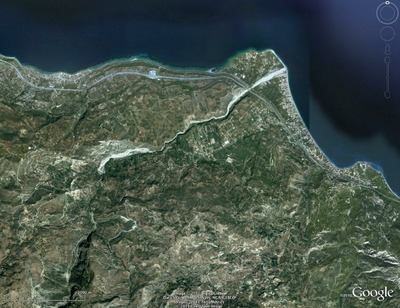 So: where and what on Google earth is this? Where on Google Earth is the best use of a coffee break since reading geoblogs. Despite not knowing much about the last one (no-one really knows how mima mounds form, even at Mima Mounds Natural Area, in Washington, USA), I happened to know where it was. So it is my honour, nay duty, to present WoGE #248. If you are new to the game, it is easy to play. 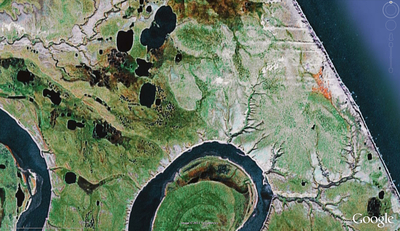 The winner is the first person to examine the picture below, find the location (name, link, or lat-long), and give a brief explanation of its geological interest. Please post your answer in the comments below. And thanks to the Schott Rule, which I am invoking, newbies have a slight edge: previous winners must wait one hour for each previous win before playing. This seems punitive, given how quickly some WoGE's have been solved recently, but there it is. So crack open your favourite virtual globe, and good luck!